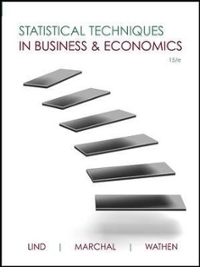 Statistical Techniques in Business and Economics 15 Edition Lind/Marchal/Wathen is a perennial market best seller due to its comprehensive coverage of statistical concepts and methods delivered in a student friendly, step-by-step format. The text presents concepts clearly and succinctly with a conversational writing style and illustrates concepts through the liberal use of business-focused examples that are relevant to the current world of a college student. Known as a “student's text,” Lind's supporting pedagogy includes self reviews, cumulative exercises, and coverage of software applications including Excel, Minitab, and MegaStat for Excel. The new 15th edition puts more emphasis on the interpretation of data and results and supports Lind's student-centric, step-by-step approach with McGraw-Hill's industry leading online assessment resource Connect Business Statistics.